Right beside the sea, at the mouth of the River Lima, Viana do Castelo has been recognised throughout history for its importance in activities related to the sea, both for the part it played in the Portuguese Discoveries of the 15th and 16th centuries and as a fishing port for cod, for which it is still noted today. In general, it is a city with good accessibility, so that inclusive routes can be defined that can be followed by all visitors since they are stable, safe and comfortable for tourists to use. The pavement is in good conditions throughout the city. 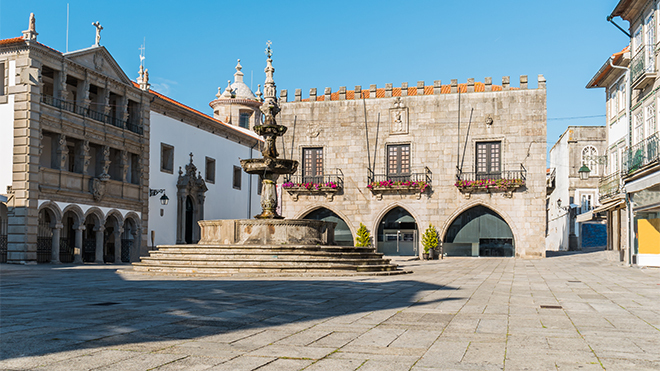 The historic centre, where most of the points of interest are located, is composed mostly of pedestrian streets, with a gently sloping central corridor in granite slabs. The pedestrian crossings are lowered or level, allowing a safe passage, although most do not have tactile or audible signalling systems. 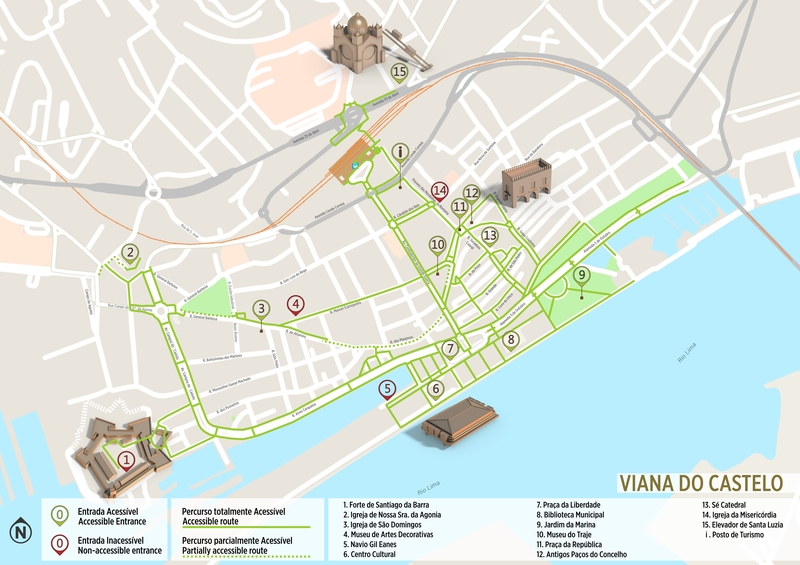 It is also worth mentioning that beside the River Lima, in the commercial areas and the area with the highest traffic flow, the road is made of granite cubes, which causes some vibration for wheelchair users or people with pushchairs. As in other cities, commercial obstacles are common, like terraces and display cases at the entrance of shops and restaurants. Viana do Castelo has a long river front, very pleasant to walk along, but tourists should nonetheless adopt a precautionary attitude due to the absence of protection against falling. We suggest an itinerary starting next to the river, in the Forte de Santiago (Fort of Santiago) (1). The fort protected the bar until the 16th century, but today it is a good viewing point, with a prospect over the sea and the riverside area of the city. When accessing the interior, take care because of the slightly degraded pavement that can cause some vibration. Go along the Campo da Senhora da Agonia, where you will find the Santuário (Shrine) (2), built in the 17th century, the focal point of the traditional Festivities that attract so many visitors to Viana do Castelo in August. The streets lined with carpets of flowers, the Our Lady of Agony's (Nossa Senhora da Agonia) pilgrimage, the Festa do Traje (costume festival), the parade of Gigantones (giants) and Cabeçudos (big heads), to the rhythm of groups of drummers, the parades on the river and the final firework display are high points of a lively cultural programme which lasts for the entire month. Continue along Rua General Barbosa, and pass by the Igreja e Convento de São Domingos (Church and Convent of São Domingos) (3), from the 16th century. Then pass by the Museu de Artes Decorativas (Decorative Arts Museum) (4), where you can admire a lovely collection of old Portuguese faience, which features among decorative art pieces, paintings and drawings from the 16th to the 19th centuries. We suggest going to the riverside, where you can visit the interesting Navio Hospital Gil Eannes (Gil Eannes Hospital Ship) (5), which for many years gave support to the cod fishing boats, also recalling the city's shipbuilding industry. On this tour, you will see fine examples of contemporary architecture, the Centro Cultural (Cultural Centre) (6) by the architect Siza Vieira, the Praça da Liberdade (7) designed by Fernando Távora and the Biblioteca Municipal (Municipal Library) (8), by Eduardo Souto de Moura. The spacious and accessible Jardim da Marina (Marina Gardens) (9) will be a good choice to take a break and rest a bit before proceeding to the Historic Centre. We’ll resume the itinerary at the Museu do Traje (Costume Museum) (10). The story of the popular costumes worn for the festivities of Our Lady of Agony, in particular in the "Stewardship Parade” (Desfile da Mordomia), in which the girls parade in their traditional dresses enriched with filigree gold thread, one of the oldest crafts, is an important cultural element in the history of Viana do Castelo. Getting to the Praça da República (11) you are in the heart of the city. 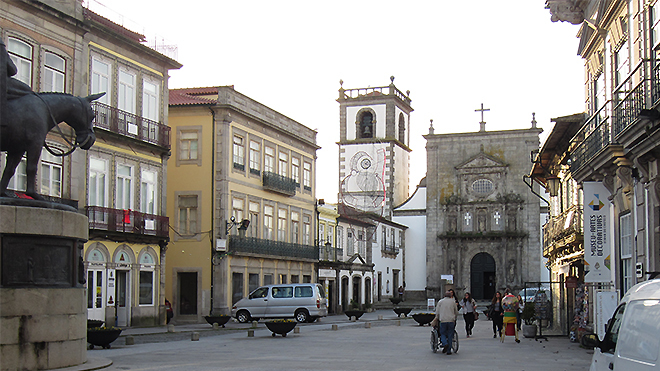 Dating from the 16th century, here we find the old Paços do Concelho (Town Hall) (12) that was built by king Manuel I, the Casa e Igreja da Misericórdia (House and Church of the Misericórdia) (14), from the 17th-18th century and the Sé Catedral (Cathedral) (13), the main church of Viana do Castelo, built in the 17th century. It has Romanesque and Gothic features, and it is certainly worth visiting. It is worth noting that some streets near the Cathedral require a greater effort because of the slight slope, Rua Gago Coutinho being an example. Wander around and enjoy the historic setting of the streets and buildings with stone façades. If you arrive by train you will be closer to this historic centre and therefore you can do the route in reverse by following the accessibility guidelines found on the Accessible Route map. Outside the urban perimeter, the visit to the Basilica de Santa Luzia (15), a monument dating from the early 20th century, is a must. Accessible by car or lift, at the top you will find a breathtaking view over the local area, reason enough to overcome the slight shaking caused by getting around in the surroundings of the sanctuary, because the floor is made of parallel strips of basalt. TUV bus company vehicles are fitted with access ramps for people with special needs. Inside there is plenty of room, reserved seats for people with reduced mobility, audible and visible warnings and Braille on the stop buttons. Some buses have platform lifts. There is information on timetables and fares of the various lines in the bus-stop shelters. Viana do Castelo railway station does not have access ramp at the main entrance, so tourists have to enter through the entrance on the right-hand side.. However, in the interior of the station there is an adapted WC and Ticket counters for people with reduced mobility. Trains have specific carriages with access for people with reduced mobility, and reserved seats. The carriages are equipped with audible and visible warning systems for stops, identifying the various stops along the route. The Portuguese Train Service, the CP-Comboios de Portugal, offers a centralised Integrated Mobility Service (SIM - Serviço Integrado de Mobilidade), accessed by telephone (+351) 707 210 746 (707 210 SIM), which is available 24 hours a day for 365 days a year, for both information and services. This service will enable passengers with special requirements to get information on accessibility on trains and at stations, assistance for embarking, during the journey and disembarking, among other services. Viana do Castelo has some taxi operators that have vehicles adapted for people with reduced mobility. 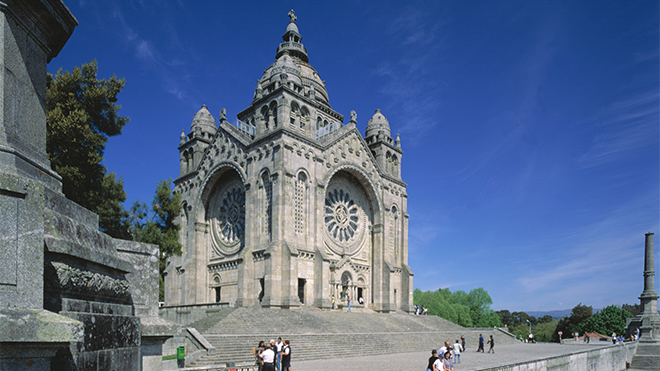 The Sanctuary of Santa Luzia is one of the main tourist attractions of Viana do Castelo, but the long distance from the main historical centre makes it difficult to visit. To overcome this difficulty, tourists can use the Funicular de Santa Luzia, which connects the Historic Centre and the Sanctuary of Santa Luzia. 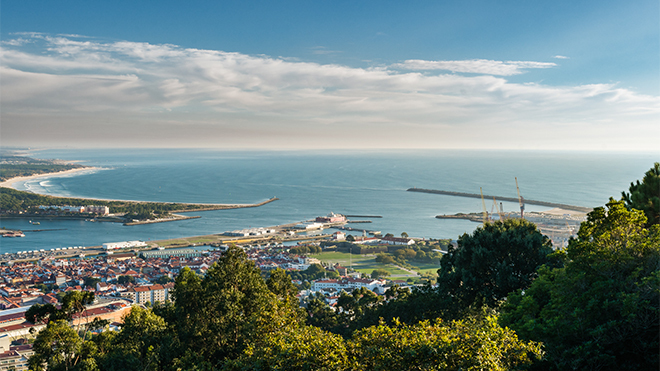 To access the support building which is on the N202 road, the tourist should head to the Viana do Castelo railway station and take the lift that will take you to the N202. The buildings that serve as the ticket office and main entrance to the elevator have ramps and access platforms to the lift. The entrance to the elevator has a small gap that the tourist should be careful of as they get in. Braille is used in the information for the tourist, as well as audible and visible warnings when the automatic doors of the funicular open and close.